WILL LA MESA BUILD A NEW LIBRARY? AND IF SO, WHERE? January 30, 2017 (La Mesa) – When La Mesa’s old police station was torn down and a new one built on the site of the aging County library that was torn down, a modest new library was built that was intended to be temporary, with a larger, new library proposed to be built on the site of the old police station. But a decade after efforts to build a new library began, the interim library building remains, with no plans yet submitted for a replacement—much to the consternation of library patrons advocating for a more spacious facility to meet modern needs. Read more about WILL LA MESA BUILD A NEW LIBRARY? AND IF SO, WHERE? October 1, 2015 (La Mesa) – Fall is in the air. Residents have a wealth of options this month with two large festivals, the annual Oktoberfest in the Village, and a new FalFest at Grossmont Center, as well as the annual Intergenerational Games. Local churches are offering a Blessing of Animals and a Fair Trade Gift Fair to sooth the soul, and entertainment opportunities include Halloween activities at Grossmont Center, a school vacation art camp at Mt. Helix, a new mystery at Lamplighters Community, and many clubs at the La Mesa Library. Let’s not overlook the opportunity to give back to our wonderful hometown at the annual Park Appreciation Day and the Human Advisory Commission’s Food Drive! IS THE LA MESA LIBRARY "INTERIM" OR "PERMANENT?" September 7, 2015 (La Mesa) -- A controversy arose at the August 11 La Mesa City Council meeting when Friends of the La Mesa Library President John Schmitz noticed that a contract for the city to hire a consultant to conduct a Civic Center/Old Police Station Feasibility Study and Master Plan did not include a permanent library building. He requested that the Council add the library back in, as it was included in earlier Master Plans. Despite this omission, the Council approved the study as is, without the library. The Council will review a Staff Report on the issue of "Interim" vs. "Permanent" library on its agenda for tomorrow at 4:00 p.m., in which Staff takes the position that the City is not obligated to build a "permanent" Library building. Read more about IS THE LA MESA LIBRARY "INTERIM" OR "PERMANENT?" 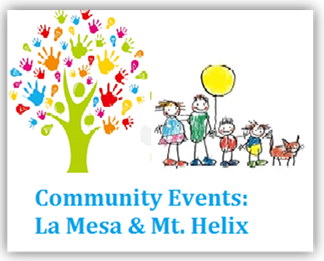 July 1, 2015 (La Mesa) – There is a lot of free summer entertainment in La Mesa this month, including concerts in the park, a movie under the stars, community theater and a walking club, not to mention a host of club activities for all ages and interests at the library. June 5 (La Mesa) -- Here's what's happening in La Mesa this month! There are a number of food events this month, including a Fire Station pancake breakfast, a Craft Beer and Wine Fest, the Taste of La Mesa, three nights of food trucks, and two nights of farmers' markets. But fear not, as there are also several ways to work off all those calories. April 30, 2015 (La Mesa) – With all the activities available this month, there has to be something for everyone here. Events range from star gazing party on Mt. Helix to a free boot camp, s SANDAG public workshops on regional growth plans through 2050, what is arguable the community's most popular event, the La Mesa Flag Day Parade (if you're not in it, you're probably watching it)... and oh, so much more. April 9, 2015 (La Mesa) – There’s something for everybody going on this month in La Mesa. There are activities for every age and interest, as well as for mind, body and entertainment. HAPPY BIRTHDAY LA MESA LIBRARY! May 26, 2010 (La Mesa) -- Come one, come all and help the La Mesa Library celebrate its second birthday Friday, May 28 with an afternoon of music by Raggle Taggle (2:30 p.m.), refreshments (3:30 p.m.), Lego building (3:45 p.m.), and San Diego County Library Director José Aponte (2:30 –p.m. to 5:00 p.m.). Since the La Mesa branch moved to its current location some 700,000 people have passed through the doors, 1,134,619 items have been checked out, and it was number one for the most circulation of 33 branches in the County Library system with 72,282 items checked out for the month of April. Read more about HAPPY BIRTHDAY LA MESA LIBRARY!